Monsieur Job opens up their 2018 impressively with the release of their single Chow Chow eyyy Pow Pow and even non-Spanish speaking listeners will be bowled over by the intensity and melody enlivening this cut. Written by band members Toby Holguin and Stan Kolev, Monsieur Job produced the song with sessions in three different studios, but despite the scattered geography of its creation, the recording presents listeners with a remarkably unified effort free from any fragmentation you might expect. No Mercy vocalist Martin Cintron’s contributions to the song are the icing on a particularly delectable musical platter and Monsieur Job has employed his talents in the best possible way. The remix included with this edited for radio release isn’t simply some placeholder to facilitate a release; Kolev supervised this re-envisioning of the song and it’s worth every bit as much attention. It has a much harder EDM edge, however, and less of an emphasis on conventional instrumentation. Those sounds are present, but Kolev cuts them up into small units, just as packed with energy, and there’s a resulting claustrophobic effect that this recasting has on listeners without ever overwhelming them. The artistry is impressive. The instinct for orchestrating the song’s percussion, vocals, and added instruments in such a way that they strike a dramatic nerve for listeners, thereby making sense, isn’t something in ready supply among musicians as a whole. Instead, they stand out for this talent and utilize it with the confidence and command we expect to hear from much more veteran artists. The radio edit, in contrast to the remix, allows all of the aforementioned elements more space in the mix to develop and, as a result, the melodic qualities are more pronounced in the radio edit than they are in Kolev’s remix. We are treated to two distinctly different sides of the same glorious coin. Much of the song’s added color, in both versions, comes from Martin Citron’s vocal presence. His effect is especially felt in the radio edit as he brings together attractive swagger with confident phrasing in a way only the most talented and/or experienced singers are capable of handling. His facility with the Spanish language inside a musical arrangement is considerable and, despite the corrective luxuries provided by a recording studio, there doesn’t seem to be a single instance where he stumbles. He adds much to the remix as well, but in a distinctly different way – Kolev applies his voice as if it’s another instrument, less self conscious of its status as a human voice, and it replaces the beats Kolev has stripped away in this version with a percussive intonation all its own. Monsieur Job has scored a significant achievement with both recordings of Chow Chow eyyy Pow Pow and it sets the stage for even higher peaks ahead of them. This is one of the most interesting projects of this scope to emerge in quite some time and there’s, thankfully, no indications of this being a strictly one off affair. 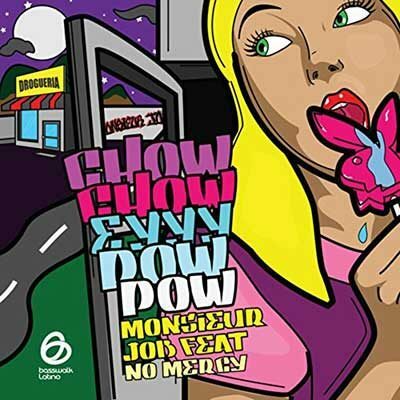 If you enjoyed Chow Cow eyyy Pow Pow, give Monsieur Job a like on Facebook by clicking here.